← The Roaring Twenties, Metropolitan Citizens, and… LOUD NOISES! 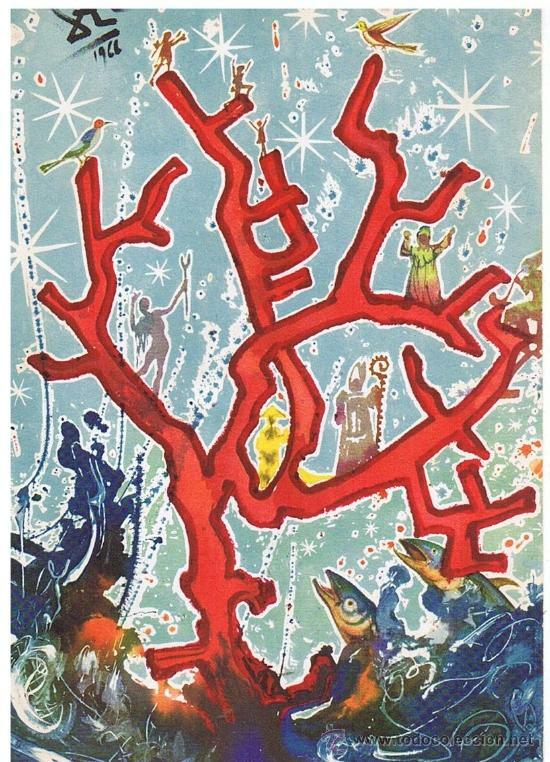 Over the weekend, while attempting to get into the holiday spirit by setting up my table-top fiber-optic Christmas tree, baking cookies, and watching the snow fall in sub-zero temperatures, I discovered that one of my favorite Spanish artists, Salvador Dalí, designed 19 unique Christmas cards between 1958-1976 for the Barcelona-based company Hoechst Ibérica. 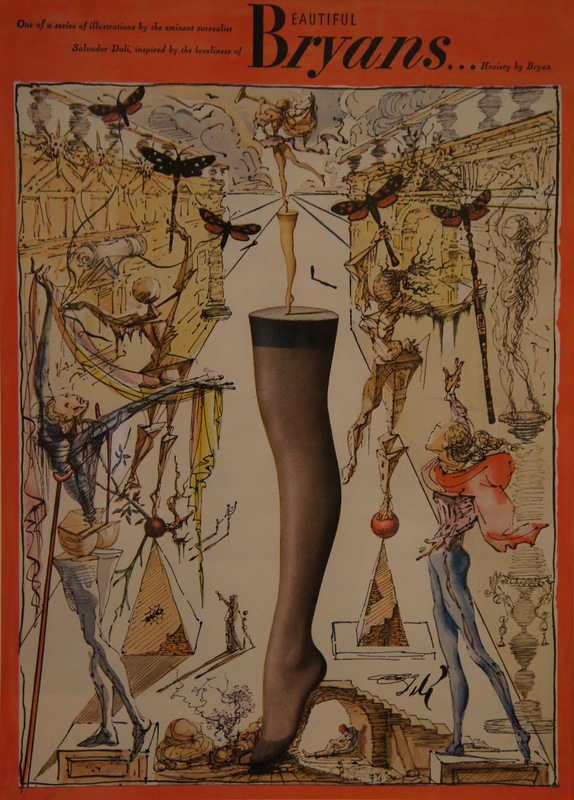 While I knew that Dalí had created artwork for advertisements (Bryan’s Hosiery) and magazine covers during the mid-20th century, I had never seen his unique portrayals of Christmas. So like any good academic on winter break, I put off my Spring syllabus-planning to do some frivolous investigating. 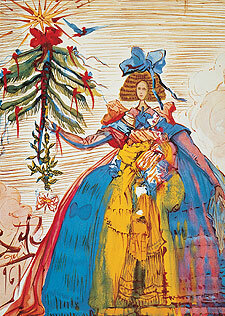 One of the earliest Dalinian images used for commercializing the holiday season was actually a sketch for a cover of Vogue magazine in 1946. 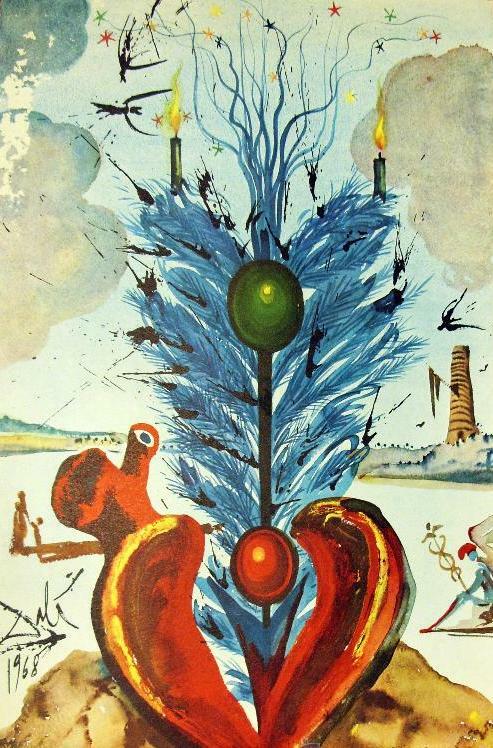 This image (below) exhibits tell-tale characteristics of Dalí’s surrealist style, including the barren, expansive landscape and the incorporation of double-images (which also characterize his depiction of the Spanish Civil War). In this particular piece, the architectural elements supporting the symmetrical Christmas trees exhibit feminine facial features, a tactic that adds a fitting flare to the cover of a fashion magazine. This more popular image is still re-printed and available as a specialty Christmas card today. 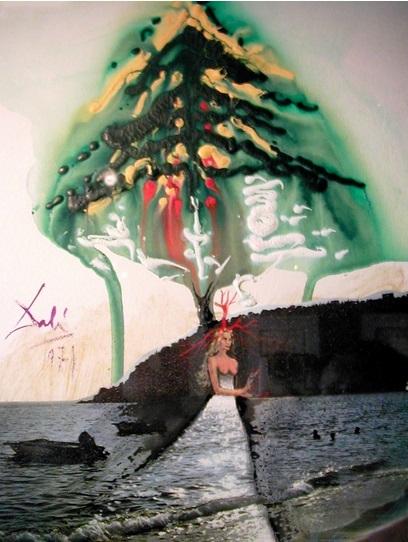 The majority of Dalí’s cards contain a short, hand-written greeting or description penned by the surrealist painter himself (though these are difficult to find online). 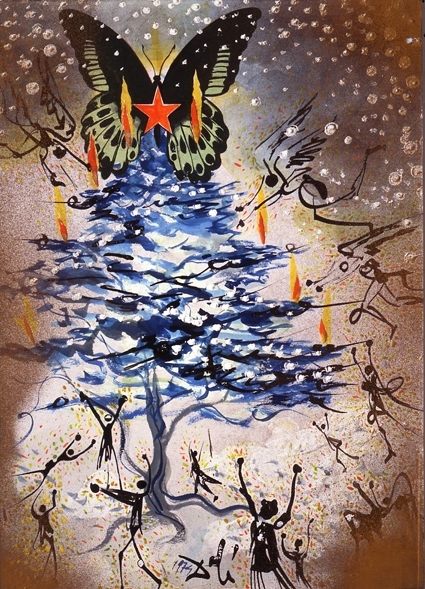 On the 1962 card below, for example, Dalí celebrates space exploration and scientific advances by labeling his portrayal “el primer Christmas astronáutico“. The holiday, it seems, was not the main focus of this year’s card, and the tree is barely visible at first glance. 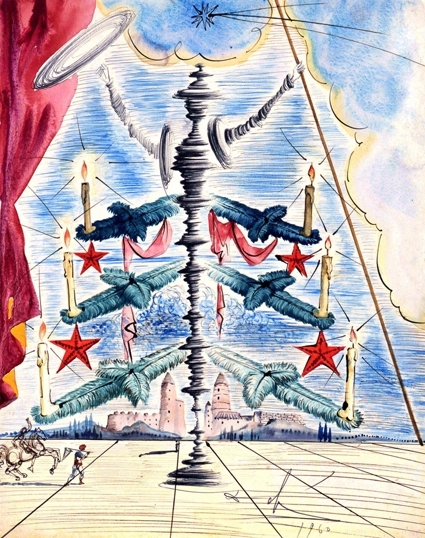 While Dalí’s holiday artwork may have found an audience in Spain, his designs were met with much less enthusiasm in the United States. 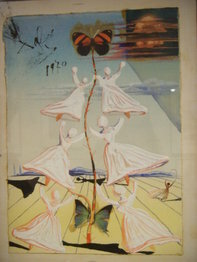 Despite the relative success of his Vogue covers and hosiery advertisements in the 1940s, Dalí could not entirely win over America’s largest greeting card company, Hallmark, or the 1950s public who supported it. By the early 1950s, Hallmark had become such a culturally relevant force in the US that it was an attractive creative partner for many high-profile artists, even actors (See Patrick Regan’s Hallmark: A Century of Caring). Norman Rockwell was (is) undoubtedly among the most well-known of mid-century American artists, and the iconic illustrator created 32 traditional Christmas designs for Hallmark between 1948 and 1957. Even today, many of his designs are widely recognized and still reproduced, as they represent a classic portrayal of Christmas as a jolly, magical, and quintessentially “American” holiday. Rockwell’s recognizable Christmas illustrations still appear on greeting cards today, over 60 years after their debut. 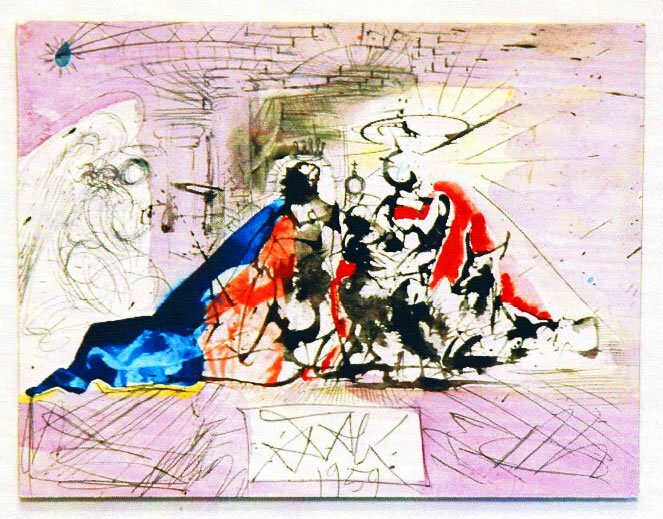 While I can’t say that the rejection of Dalí’s surrealist, abstract take on Christmas in 1950s America is entirely surprising, I am disappointed that I haven’t seen these images before. They seem to be part of special exhibitions, appearing in Barcelona’s CaixaForum in 2006, and in Dalí’s Teatro-Museo in Figueres in 2008, but I’m not sure where they are displayed or housed today. I spent a considerable amount of time lost in the depths of the internet trying to amass a collection of these designs, and below are some of my favorites (well, pretty much the only images I could find via a few hours with GoogleImages…). 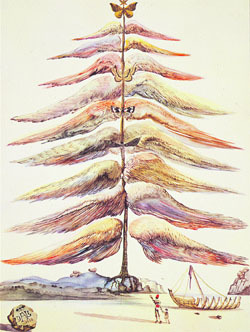 Navidad, Dali, 1970 – Text: I can make out the English phrase “Flower Power” in quotation marks, and I believe the first words are “Las campanas,” or “The bells.” Anyone with better eyes want to help? If it weren’t for digital cameras, photo editing software, and one-hour made-to-order holiday photo cards allowing us to brag about our own lives and accomplishments in the name of reconnecting with friends and relatives, perhaps we might exchange more artistic renditions of the Holiday Season today. When exactly did the holiday “greeting card tradition” transform into the creation of “personal photo montages”? 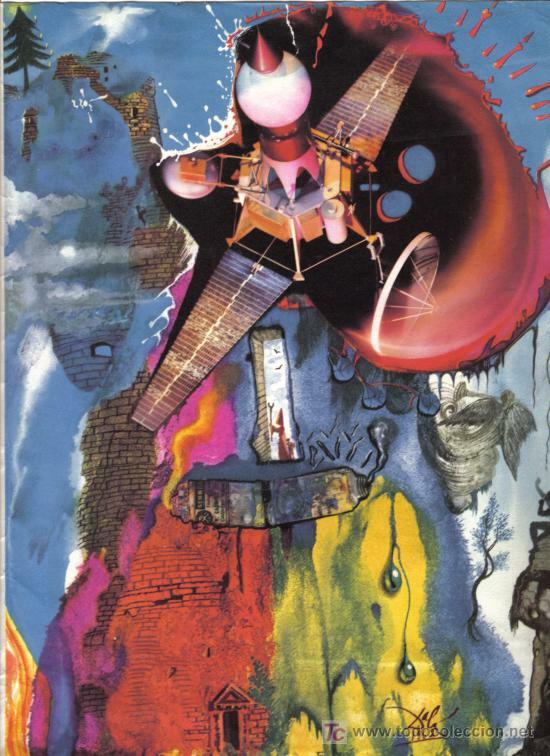 Dali: The Paintings: This excellent book on Dalí by Robert Descharnes and Gilles Néret contains ALL of the artist’s paintings – It’s my favorite volume, and I”ve linked to it in all my posts on Salvador Dalí. 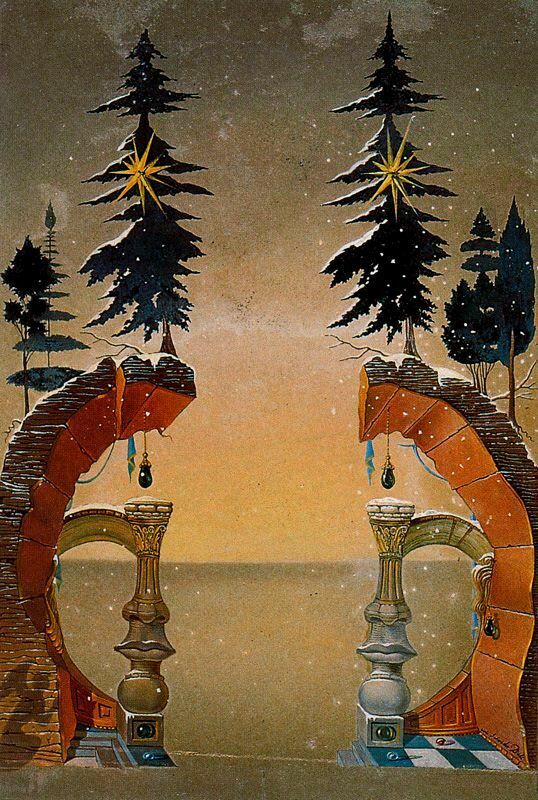 This entry was posted in Art, Spain, Surrealism and tagged 1950s, art, Barcelona, Christmas, Navidad, Salvador Dali, Spain, spanish, spanish art, surrealism, teaching spanish. Bookmark the permalink. Las campanas de AZUCAR, frente a las fuerzas del mal, repiquetan la gloria del “flower power” de los ¿campamentos/camposantos? navideños. I really can’t tell what the second-to-last word says, and it seems to have an accent, which neither of my suggestions do. Love the cards, by the way. Thanks for posting them! I come up with a little bit different translation of that card (and I admit I’m guess about some of this because Dali’s informal punctuation. The big mystery here is “sugar bells.” Literal? A nickname? Slang? “Las campanas de azucar, frente a las fuerzas del mal repiquetean la letanía del “flower power” de las campánulas navideñas”. ¡Nada para la historia de la literatura! pero una muestra de sus ocurrencias. 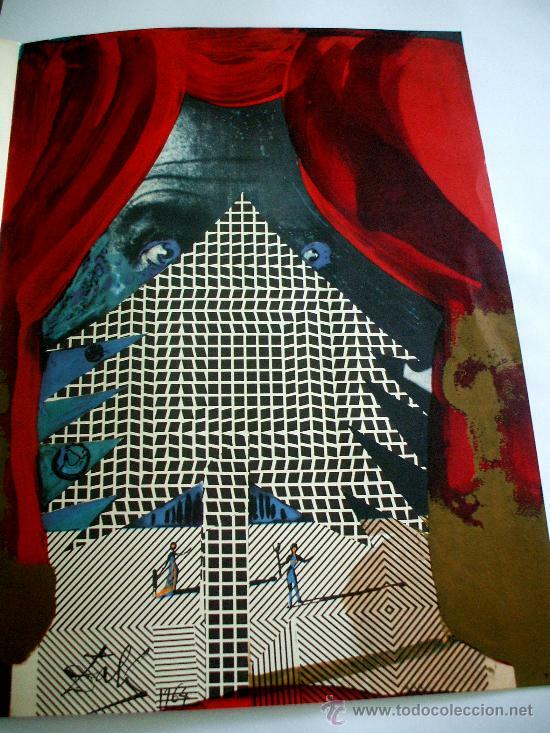 Have a truly surrealistic holiday season! Pingback: Auguri d’autore. | quasi. 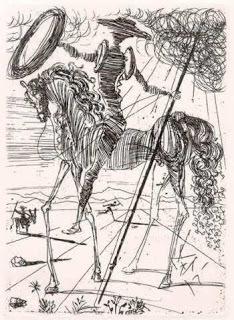 Dali was not a Spaniard, He was a Catalonian, and this is probably in the Catalan language, which is somewhat different than Castillian Spanish. Catalan is one of two official languages in Spain, and was part of Ferdinand (of Ferdinand and Isabella) Trastamera’s empire, which also included the Crown of Aragon (his daughter was Catherine of Aragon),the Kingdom of the Two Sicilies, which included Sicily, Sardinia, part of Corsica, and Naples and all of Italy south of that, about 40% of modern Italy, as well as the Baleric Islands, the Canary islands, some city states in north Africa that Spain still maintains, and some other places. Catalonia was a separate kingdom for over 1000 years, and maintains it’s own large and growing separatist movement. Do you possess all those cards? Or do you know where I can get those? It would be very kind of you if you let me know the information. Thank you!